The Masters. Two words that mean something different to all of us. For me, it’s the epitome of Major Championship golf. It’s a tradition like no other. It’s the green jacket. It’s Rae’s creek. It’s blooming azalea’s. It’s figuring out how to manipulate a work schedule so I do not miss a single minute of coverage. It’s biting my nails until Masters.org coverage begins in the late morning. It’s Tiger Woods in 1997. It’s Phil Mickelson’s shot out of the pine straw that we all knew he should not try but we hoped he would. 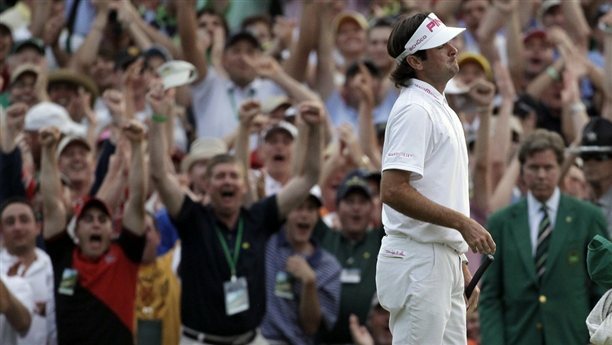 Well, this is what the Masters was to me before Thursday, April 5, 2012. From that day forward the Masters will always be different for me. I owe it all to THP’s relationship with Bridgestone Golf. As a golf fan, the week of the Masters starts with me watching every single minute of the Golf Channel as soon as the Shell Houston Open is over, and as the week progresses I watch “Live From the Masters” every time it comes on. After the rounds are over, I tune in to see all the post round analysis, criticisms, praises, highlights, etc. It’s basically a 24/7 Masters-fest for me until 12:00 am Monday morning. If you are like me then you had to notice that most of this coverage on the Golf Channel is sponsored by Bridgestone Golf. You see, Bridgestone’s domestic headquarters are based in Covington, GA. In fact, if you leave Augusta on I20 and head West, in about 2 hours you will find yourself in Covington. So in essence, the Masters is a big deal to Bridgestone and from my experiences, they take full advantage of being the “hometown” equipment manufacturer. For those of you who do not know, Augusta National has no VIP tents or designated areas for manufacturers to display or advertise their product. What Bridgestone does is pretty cool and it’s something definitely worth mentioning. They decided to come up with some Bridgestone SWAT teams, armed with 2-ball packs of their golf balls and t-shirts, who literally go to local golf courses during the day and restaurants at night, where they give out samples and t-shirts to people. I thought that was both cool and a great way to think outside the box. So while Bridgestone cannot have the presence they want inside the gates of Augusta National, they sure have a commanding presence outside the gates in Augusta and all over the Golf Channel during Masters week. The anticipation of getting to Augusta National was unreal. I wasn’t sure what to expect. You hear about the sacred grounds but seeing it for the first time literally takes your breath away. It all starts with navigating your way through the acres and acres of parking area. Even that is gorgeous and organized to the finest detail. Fortunately, the Bridgestone team had what they referred to as a “parking house”. It was a place to valet your car, pick up your day pass for the event, and have a refreshing beverage if you felt like being festive. The house was conveniently located to entry Gate 9 and we immediately headed that direction. The sea of people was overwhelming, but in a good way. You could feel a buzz and an excitement from everyone. Complete strangers would strike up a golf related conversation in no time. All before you even walked through the entrance. The gate entrance is as secure as a TSA security check at any domestic airport. The main difference being that the staff at Augusta National is cordial, happy, and extremely welcoming. Once through the security check, you have your pass scanned and you’re given a Spectator Guide. I like being referred to as a “spectator”, as though for a week out of the year, the members allow the world a glimpse into the golf Mecca they call home. The guide is full of incredible historical facts, from the history of the holes on the course to where the ideal viewing areas are for each hole, but most importantly, about each of the participants in the 2012 Masters. After a brief walk, you start finding your way amongst the foliage and old growth of Augusta National. The first thing you see is a massive complex featuring a souvenir shop and concession stands. If I can think of one word to describe how things run at Augusta, it’s efficient. They can move people in and out of these facilities like I’ve never witnessed. After a brief stop in the souvenir shop, mostly due to feeling somewhat overwhelmed, I headed to the concession stand for an infamous pimento cheese sandwich. Everything is labeled as “Masters”. There are no corporate sponsors, no Coca-Cola’s, no Gatorade’s. It’s fantastic! 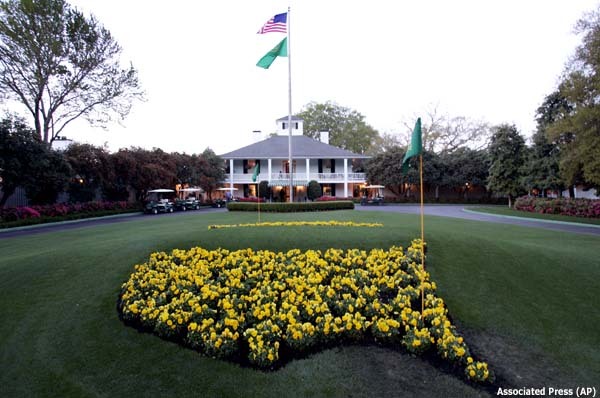 It was like Augusta National is its own Nation with its own economy. What really blew me away were the prices. Everything was priced cheaper than if I were buying that at my local golf course. I thought that was a complete added bonus. After a snack and some hydration, it was time to see the golf course. Signage told me that if I took a left we could go to Hole #5, and if I took a right to Hole #15. I decided to save Amen Corner and the latter holes towards the end of the day so off to #5. As soon as the trees part a little bit I saw my first glimpse of the competitive grounds of Augusta National. Words cannot describe the sensation one experiences when seeing that for the first time. It literally makes you stand there, taking in every single detail of what you see. Lush, green, perfect fairways. Rough that looks picture perfect and features a depth of green that is indescribable. Bunkers that are massive, but as white as a cloud. 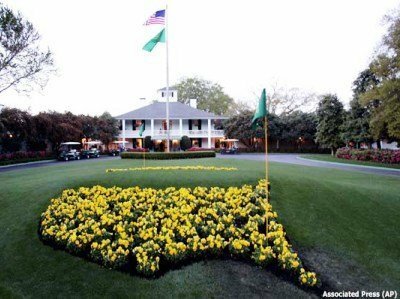 However, the true gems of Augusta National are the greens. They draw your eyes in. They force you to imagine how it’s possible to keep a golf ball on them. They are big. They are scary. They are far more undulated that I ever imagined. They have withstood the footsteps of absolute legends in the history of golf. What you see is simply the pinnacle of golf courses, and for a few minutes, you get emotional. Once I settled myself and realized that I was in fact standing not 10 feet from the right edge of #5 fairway, a golf ball promptly lands in the rough right in front of me. Perfect! My first experience of seeing golf at Augusta National, and I get to be as close as you possibly can to it. Up walks Johnson Wagner. He’s playing with Tom Watson and an amateur from Japan. We hear every bit of dialogue between Wagner and his caddy. I’m checking out the equipment in his bag because that’s what THP’ers do. They confirm numbers, he stands behind the ball, then complete and utter focus and commitment. He rips an iron shot and all I can focus on is the sound it produces. The crisp sound of his iron shot echo’s amongst the old, tall trees that line the fairway. His ball lands on the green, the crowd in the stands applauds his effort, I strike up the nerve to say “great shot”, and I get the look and the nod and the tip of the cap from him. It’s official………I am officially a spectator at the greatest golf event in the world! And I am ready for more. It would be incredibly easy for me to recount every single player and shot that I witnessed during my day at Augusta National, but I think my reader’s would get bored and this piece would be way too long. What I would like to do is mention a few of my personal highlights from my experience there. One thing that was pressing was to watch some Bridgestone staffers in action. 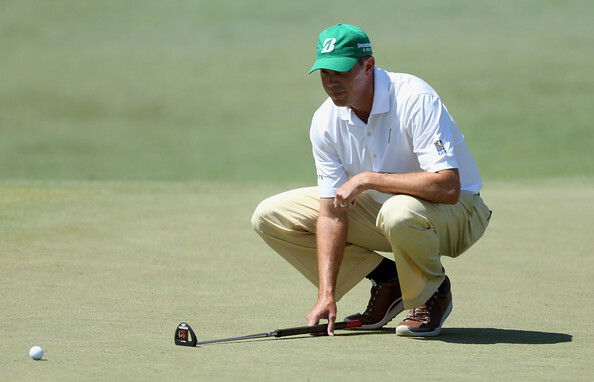 There were three Bridgestone staffers in the field: Matt Kuchar, Brandt Snedeker, and Fred Couples. They really stood out to me, mostly because of the Masters Edition Bridgestone Staff bag. It was a very bright and vibrant yellow and it features that “green jacket” green that you would expect. Some of my observations about each of the guys is that Matt Kuchar is much taller in person than I would have expected and he was absolutely fantastic with his interactions with the crowd. In fact, he walked right past me and the Bidgetsone rep I was with coming off the Ninth green, did a double take, and came back to say hello and to high-five said Bridgestone rep! I could not believe it. Here was Matt Kuchar, in the heat of the first round of the Masters and he took some time to recognize someone he obviously knows professionally and supports him. We actually ran into Brandt Snedeker as he made his way to the putting green. He is also taller than I imagined and when we offered some vocal support, he took the time to thank us. Brandt has such an infectious smile. Something that he and Kuchar both share. Then there’s Freddie. We watched Freddie stroll to the first tee in typical Freddie swagger. If there is one player that might pull a bigger crowd at the Masters than Tiger Woods, it could be Freddie Couples. I was blown away with how many people there wanted to see and support Freddie. He sure does not disappoint his fans either. His swing is more fluid in person and he sure can move a golf ball out there. He plays the new J40 Dual Pocket Cavity irons and the B330 golf ball, while Brandt Snedeker and Matt Kuchar both play the J40 CB irons. Brandt plays the B330 golf ball like Freddie and Kuchar plays the B330S. I wasn’t aware of that until I saw it in person. Perhaps my favorite spot to be on the entire course was around the 1st tee, 18th green, 10th tee, and the putting green. I could have stood there all day and watched player’s come and go, or make their way from the front 9 to the back 9. If you stood there long enough you would see Doug Sanders in the most spring like yellow outfit and shoes I’ve ever seen. 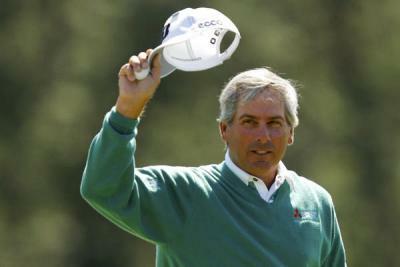 You would see Ben Crenshaw casually stroll by after his first round. You might almost accidentally bump into Adam Scott and Martin Kaymer. You would see Peter Hanson walk through the crowd to the putting green without anyone realizing who he is. You would see Bones walk Phil’s bag to the green and watch swarms of people flock to the putting green in hopes of getting an up close glimpse of Phil Mickelson. The point is, if you stood there long enough, you could literally rub shoulders with some of the greatest players in the game of golf. As a golf fan, what more could you ask for? For the rest of the afternoon we decided to park ourselves in the grandstands behind the green at #11 and the tee box at #12. It was pure joy to watch these guys either attack or fear the back right pin position at #12. We saw a few balls find their way into Rae’s creek and we saw some shots that never left the flagstick. However, the true joy of sitting in that spot is that everyone who comes and goes to the seats around you are as passionate about the game as you are. Everyone likes to root for their favorites and badgers their least favorites but everyone does it with a smile and a laugh. The patrons at Augusta are polite, up to date on their golf, love golf equipment, and you really get a sense that you share a common bond with them; that you’re a Masters experienced golf fan. We waited in the grandstands until the last group of the day came through. That group featured Phil Mickelson, Hunter Mahan, and Peter Hanson. When Phil Mickelson walked off #12, he was 4 over par. We decided to follow him through to the 16th hole, which is absolutely breath taking. You walk up #13 and you are taken back to the shot Phil hit from the pine straw in 2010. You stand behind the green at #16 and you realize just how amazing the chip in was that Tiger Woods made. In fact, you stand there and wonder how he did that. Augusta National is like a pen-pal. You can get to know this course from watching so many tournaments in the past but you just do not get to know it until you set foot on those glorious grounds. My Masters experience was phenomenal. It would have never been possible without the relationship that THP has forged with Bridgestone Golf. It blows my mind how much respect both of those organizations have for each other. I never fully understood how influential THP is in the golf industry. It changes my perspective on a lot of things. Before I wrap it up, I do want to let you guys know about one more phenomenal experience that occurred on this special day. I were invited to what is known as “The Bridgestone House”. We were just planning on stopping by briefly in order to say thanks for the passes and the wonderful day. However, we were asked to join the team for dinner. Dinner consisted of some incredible influential employee’s of Bridgestone Golf and some of their corporate VIP customers. To say I felt a little intimidated would be a massive understatement. However, that intimidation went away very quickly. Over dinner we discussed all things golf. We talked a lot about the industry, the importance of fittings, but what really stood out to me was just how curious and inquisitive these gentlemen were about THP. It was nice to be able to answer their questions confidently. If you guys are reading this, thank you for your hospitality, generosity, and willingness to accommodate a guy like me. You are all passionate about what you do and I thank you all for answering my questions and allowing me to break bread with you. Finally, I have to thank Josh, Morgan, and the Bridgestone. You guys literally made a dream of mine come true. I cannot express enough gratitude to do what you guys did for me justice. The relationship that you guys have developed in this industry is strong, confident, and visionary. You all continue to push the envelope and I’m thankful that sometimes I get to go along for the ride. My Masters experiences will never be the same and that’s because of THP and Bridgestone Golf. From the bottom of my heart, thank you all for the best golf day of my life. There are not enough adjectives to describe the emotion that I could feel when reading this. Incredibly well written….I’m speechless. Thanks for your comments. It sounds like you had a great experience. I enjoyed reading that TC and felt like I was there with you…although I am eternally jealous as it’s on my bucket list to get to experience the Masters in person as you did and even more so now. I’m glad you had a great time and hail Bridgestone and THP for making it happen for you. Couldn’t of happened to a nicer man. Great read TC…thanks for sharing that. Glad you had such an awesome time. Well written TC! And thank you for sharing this with us and thank you Bridgestone who made this possible for a THP’er!